This is perhaps the post with the most unique blend of happenstance and foodie passion here at Betty’s Cook Nook. Tucked in the very back of Mom’s cookbook is a tiny accordion-folded recipe booklet called “How to use your Treat-Time Toaster.” You can enjoy a scan of it below. I had thumbed passed this booklet many times before but in late January 2017 I finally took my curiosity online to try and find out what a “Treat-Time Toaster” might actually be. In just a few clicks I found myself at eBay where I discovered these toasters were in fact vintage grilled sandwich makers. 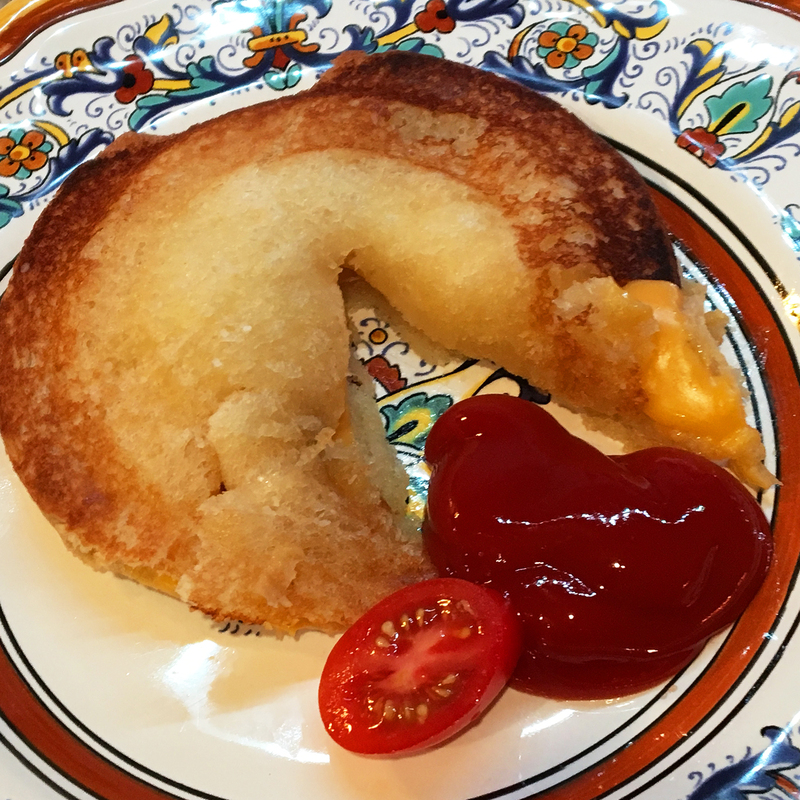 These were the same things I remember being in our kitchen at Trailend Drive – Mom used them to fashion some of the coolest grilled cheese sandwiches ever! After quickly checking with my older brothers about the whereabouts of our toasters, I sadly realized they were long, long gone. Gone, too, was the company who made them – NuRod, Inc., based out of Monrovia California. So since I couldn’t score one of my own new Treat-Time Toasters, I found a set of two vintage toasters that I scored on eBay for about $30, including shipping. A few days later a bountiful box arrived at my home and boy, was I excited! Soon my kitchen would be turning out delicious sandwich snacks. The possibilities were endless, thanks to the recipe booklet that contained 13 ideas for transforming mere bread into a myriad of mouthwatering delights filled with awe-inspiring ingredients like cocktail sausages, bologna, baked beans, raisin bread, marmalade, fried eggs and more. 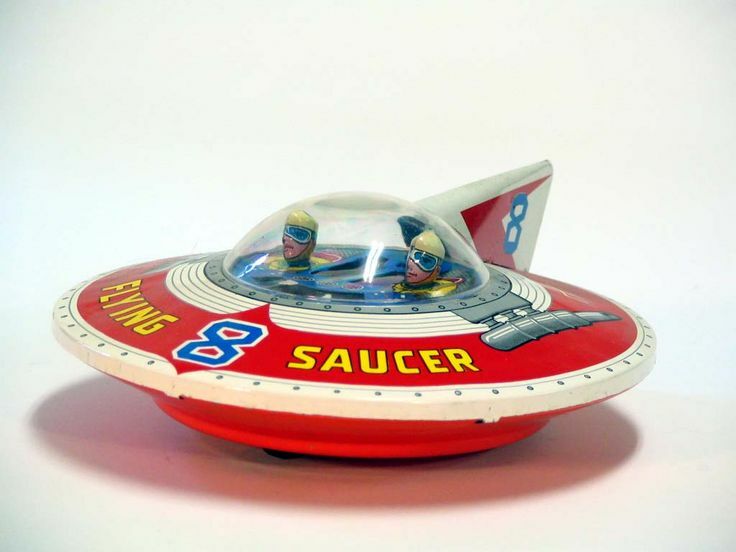 The Treat-Time Toaster looked part flying saucer and part clamshell. Placing the toaster over campfire or stove in mere seconds you can create panini, grilled sandwiches, pocket sandwiches … anything your mind and appetite can conjure! 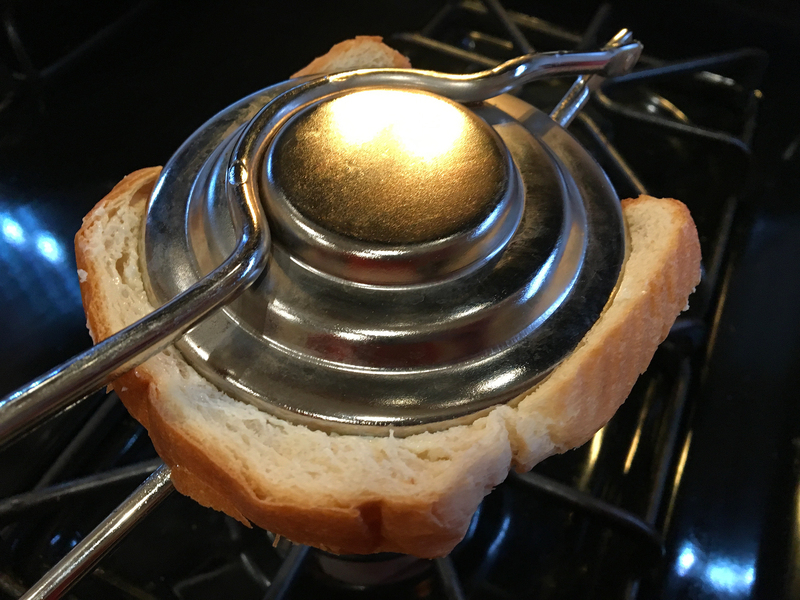 The toaster churns out culinary delights that remind me of those from the raclette tabletop grill, which has been a favorite kitchen accessory of mine for many years. The folks at Nu-Rod also knew a little something about target marketing back in the early 1960s. 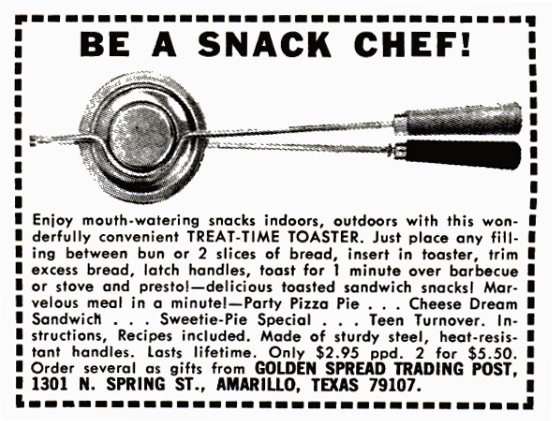 I found evidence of ads for their Treat-Time Sandwich Maker in Popular Science, Boys’ Life, Mobile Home Journal, and V.F.W. Journal. So if the Treat-Time Toaster is so awesome, why did it disappear from America’s kitchens almost as fast as it arrived?! Based on my online research Nu-Rod was in existence from 1960-1970 and then their digital footprint is no more. Perhaps they were intent on connecting the Treat-Time Toaster with men more so than women? Or perhaps the name “Treat-Time Toaster” was too innovative at the time. Whatever the case all I know is I’m glad I’ve reconnected my appetite with this fond foodie kitchen gizmo. ❤ While supplies last you can likely find vintage Treat-Time Toasters on Ebay or similar machines like these on the web. I ordered two so that I didn’t have to share my toaster with anyone else! Hey, twice the fun! 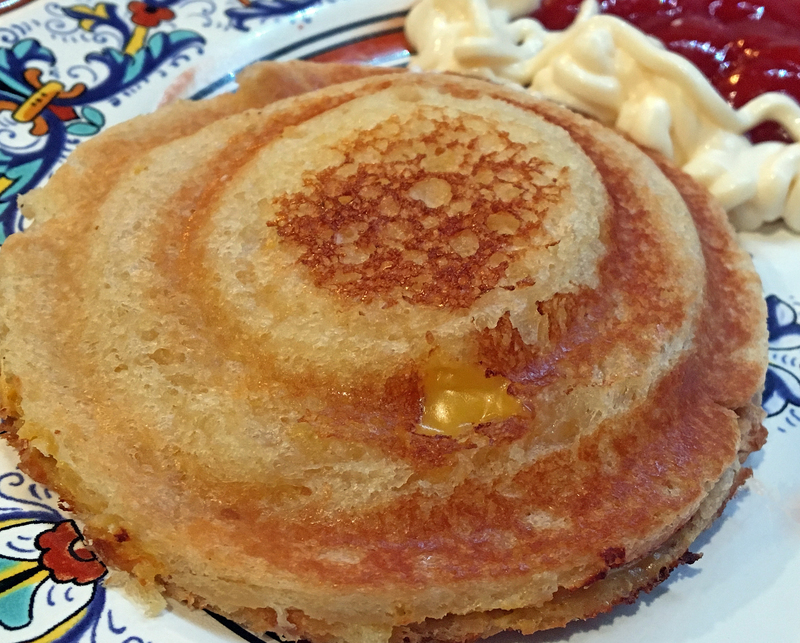 ❤ The ingredients list below is for the most basic – and delicious – grilled cheese sandwich. But don’t let your imagination and appetite stop here – try any of the original recipes in the Treat-Time Toaster recipe book (below)… or you let your imagination go wild. 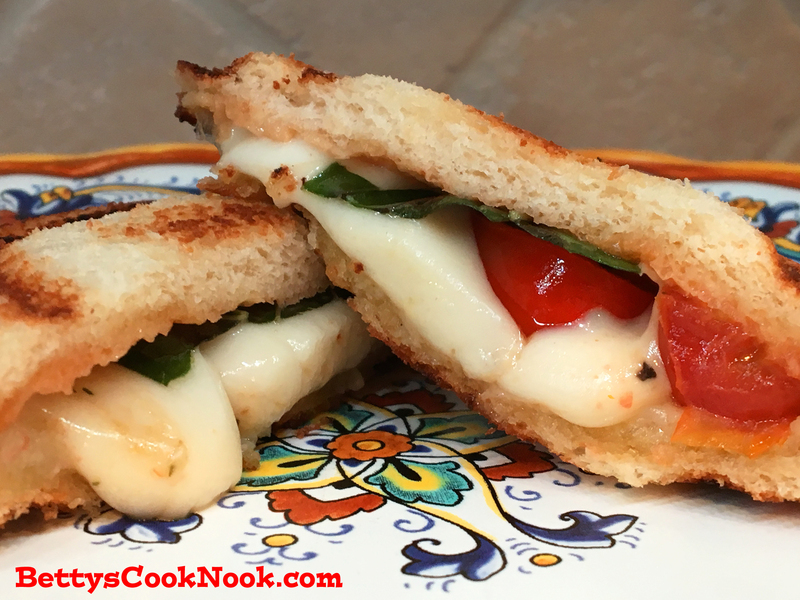 My top three favorite sandwiches are grilled cheese, PB&J, and our own creation – a grilled caprese sandwich (shown above), crafted from mozzarella, fresh basil leaves from the garden and a few slices of red tomato. 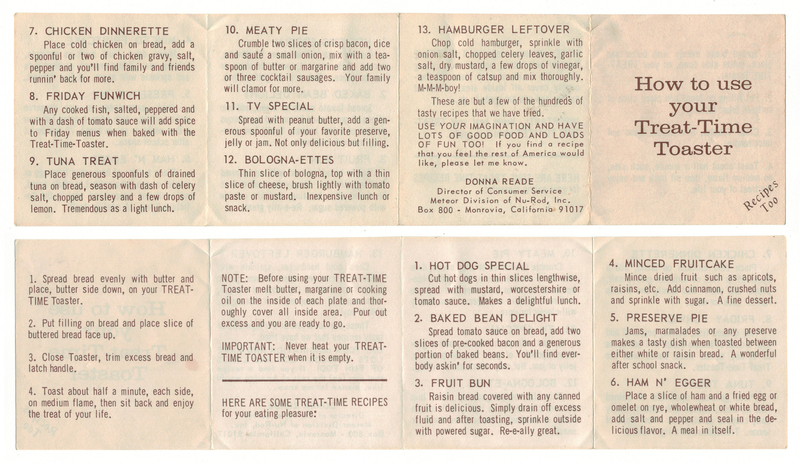 Click the image for a close-up view of some of the original Treat-Time recipes! 1. Butter the outside of two slices of bread and set aside. Hey, if you’re feeling adventurous you can also butter the inside, if butter complements your chosen ingredients. 2. Top one inside with your chosen ingredients, making sure to keep things mingling toward the center of the bread. 3. Butter or spray both insides of your Treat-Time Toaster to prevent sticking. 4. Center and place your buttered sandwich onto the toaster and close the toaster. Squeeze tight and remove the excess bread. Latch the handle. 5. 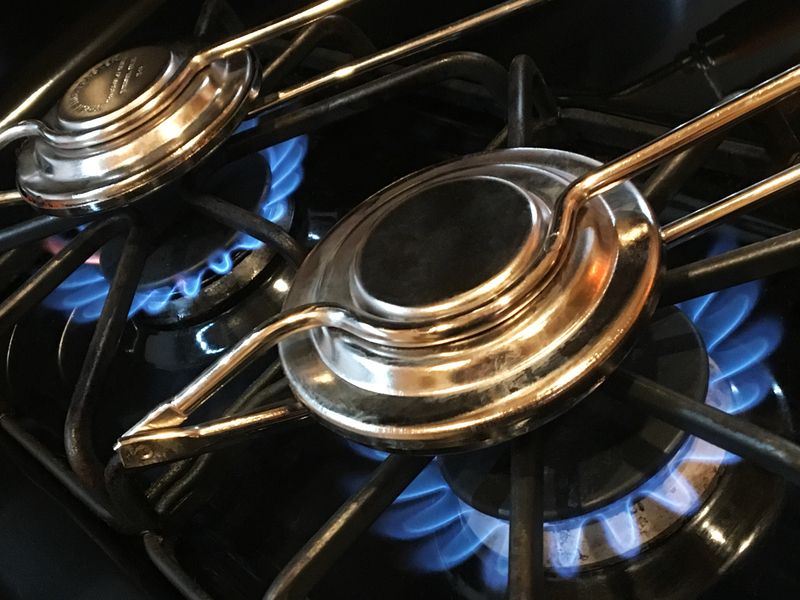 Hold/Place the Treat-Time Toaster over campfire or medium-fired kitchen stovetop for 1-2 minutes on each side. I used my toaster inside over a gas range. I experimented a few times to find the right combination of flame and time to deliver the perfect oozy, gooey, buttery treat. Serve warm with your favorite sides! The ButterKrust bakery way back then… I love the art deco lines! One of my favorite childhood memories happened when our elementary school (go, Northwood Unicorns) made an outing to San Antonio’s ButterKrust Bakery that graciously rested alongside 2251 Broadway Street. I’m confident my love of carbs was born that day. In fact, every time I drove past the bakery (passenger or driver), the window somehow found itself miraculously resting so I could enjoy the waft of butter and bread while the wind whipped through my hair. Never underestimate the power of bread! But gosh, I hope the power of ButterKrust bread outlives me, no thanks to their new owner’s shameful and shoddy company website, which looks circa 1995. More ButterKrust bakery history here. Yup. I scored this vintage spot for you! Are You Bready For This? After setting my appetite on making this twisted bread, I realized that Mom’s cut-out recipe had a seriously odd shape and some of the article was missing (see the original far below). I flipped the time-worn clipping over and realized that Mom must have really cut out the recipe on the reverse as the shape and article size were spot on. Finger to forehead! What was on the back, er front, of the recipe? 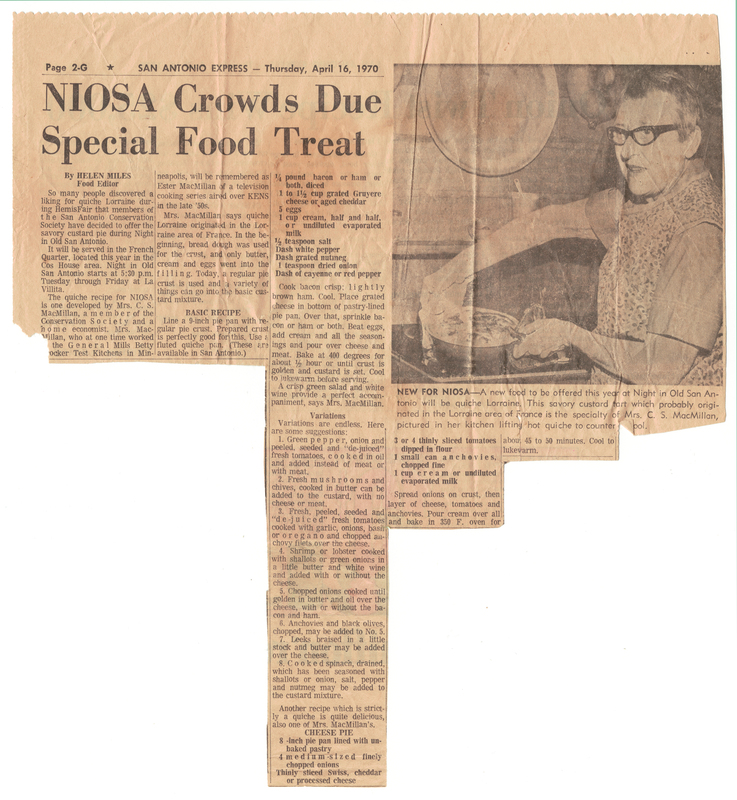 A 1970s story about NIOSA which included a recipe for Quiche Lorraine – a dish that garnered serious street cred at the 1968 World’s Fair held in my hometown of San Antonio. H.R. Pufnstuf debuted at the fair – something I just learned! A few words about this recipe: I was super-surprised to learn that the recipe’s creator – Mrs. Nan Robb – won $25,000 for the recipe … in 1970! $25,000 is a lot of money today. So while I joked about eating $25,000 bread, today I found out that after inflation, in 2015, $25,000 of 1970 money is really worth about $155,000! For real! So now you have a funny story to serve along with this bread! ❤ I’ve had a few foodie fails here at Betty’s Cook Nook. My first attempt at making the dough for this recipe is one of them! Turns out the yeast I had on hand was old and after mixing everything together I think the bread actually fell rather than rose. LOL. So make sure and score some fresh yeast from the store to ensure your bread will rise to the rooftops. ❤ Feeling a little insecure about my ability to rise bread, I resorted to some online research to look for tips. Warm ovens and heating pad suggestions aside, I netted out with boiling some water in a glass measuring cup to warm my microwave. I covered my dough-filled bowl with a towel, inserted it into the microwave along with the water and let it do its thing for an hour. The dough more than doubled in size. Magic! ❤ You can easily half this recipe. What I wound up with was about the size of a boogie board. You can also make two “half-sized” loaves by cutting the dough strips in half before braiding – what better way to give a $12,500, er $77,500 gift (post inflation) to a friend?! 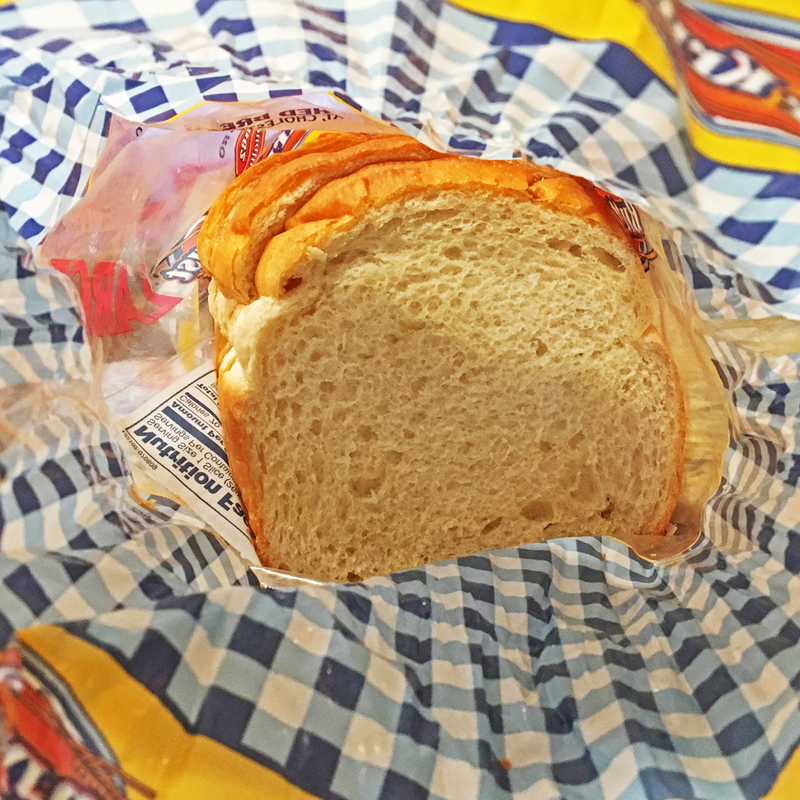 ❤ I’m not going to point out the obvious but since I obviously pointed something out … you can introduce any of your favorite ingredients into the filling for this twisted bread recipe. I’m thinking of ham and cheese or bacon and maybe a little scallion. 1. Grease a large cookie sheet and set aside. That was easy! 2. In a large mixer bowl dissolve the yeast in warm water. There’s no need to sift the flour – add 2 cups of the flour to the yeast mix (reserving the 2 cups of flour for later), and add the sugar, salt, water, milk, butter and egg. Blend at low speed until moistened then crank up the speed to medium and beat for 2 minutes. By hand, stir in the remaining 2 cups flour to form a soft dough. Mix it well! Cover the dough and let it rise in a warm place until light and it has doubled in size, about 45-60 minutes. 3. While the dough is doing it’s thing let’s make the filling. Melt the butter in a saucepan over medium heat. Add the remaining filling ingredients above and mix well. Let rest. 4. After the dough has risen, stir it down. Transfer from bowl then toss it around on a floured surface until no longer sticky. 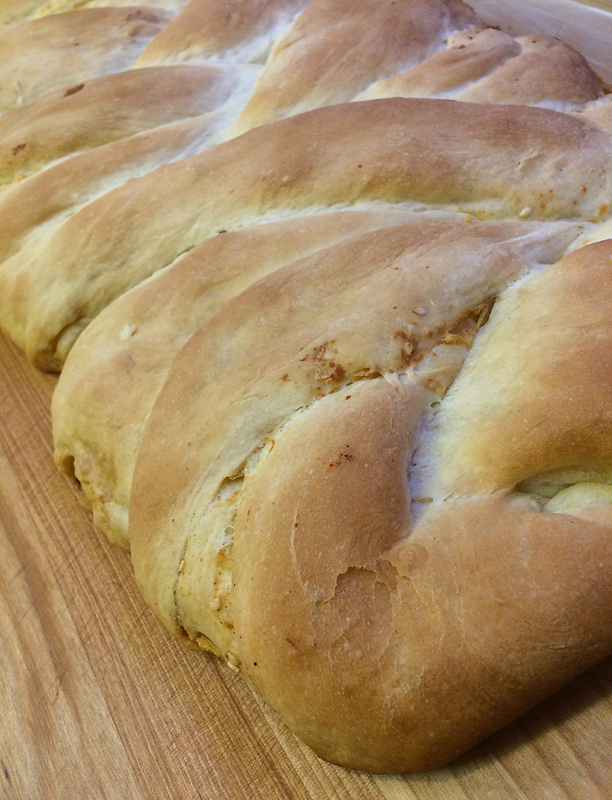 Roll the dough out to a 18″ x 12″ rectangle. Cut the dough into three 18″ x 4″ strips. 5. Spread each strip with the filling mixture, making sure to leave about a half inch around all edges filling-less so you’ll be able to pinch and seal the edges together (you’ll want them sticky). Start with the 18″ side and roll each strip up and press/seal the edges together so the filling is safe inside the doughy roll-up. 6. On your prepared cookie sheet, braid the 3 rolls together. Cover and let it rise in a warm place until light and doubled in size, about 45-60 minutes. 7. Bake in a preheated 350°F oven for 30-35 minutes, until golden brown. I loved this bread warm and fresh out of the oven. You could also slice it to make a savory sandwich bread. I joked above about the odd shape of this cut out. Here’s another Betty’s Cook Nook recipe with a funky shape! 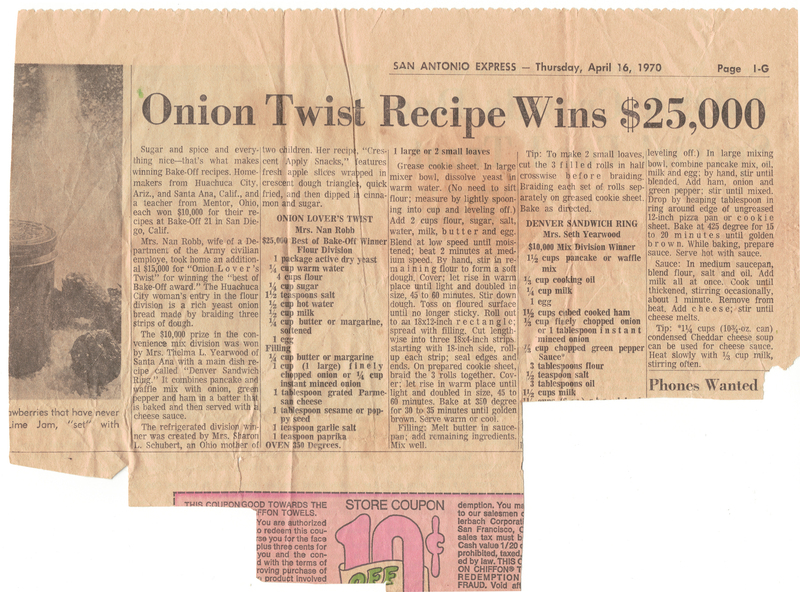 It’s not a chicken dinner per se but today is your lucky day – I’m posting the reverse side of the Onion Lover’s Twisted Bread recipe! Go on, click on it for a larger view of what’s coming next to Betty’s Cook Nook!